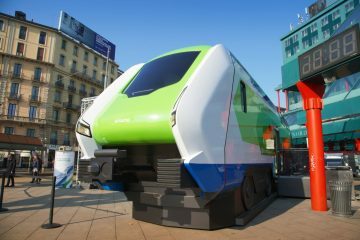 Recently, five Stadler UK Dual electro-diesels have embarked on a journey to the UK. 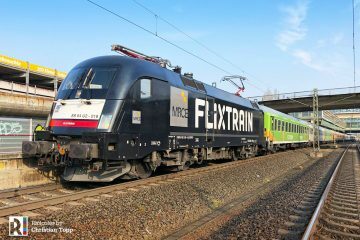 There, the Class 88s will join class member 88002 that arrived in late January for static and dynamic trials, driver familiarization and certification. 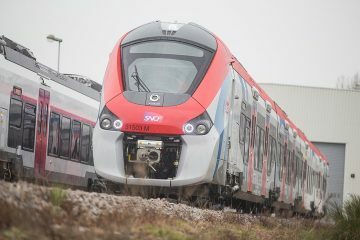 Since the arrival of 88002 in the UK, another five locomotives left the Stadler Rail Valencia works in Albuixech. 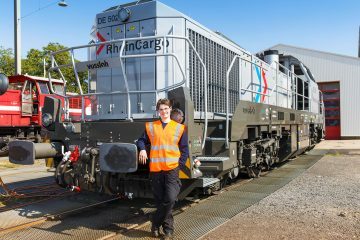 At the port of Sagunto, the locomotives were gathered awaiting the arrival of the Eemslift Nelli, a general cargo vessel owned by Dutch shipping company Amasus Shipping. The quintet consists of 88001, 003-005 and 008. 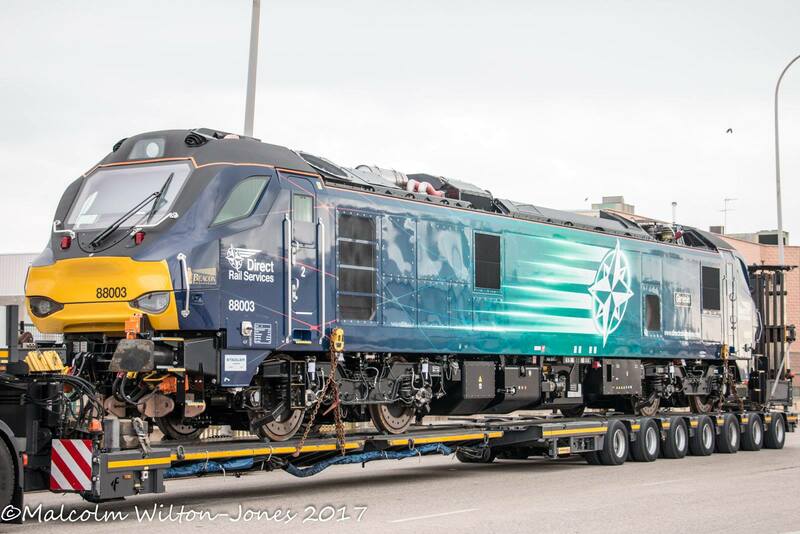 The future Beacon Rail / DRS 88003 ‘Genesis’ heads for the Port of Sagunto on a low loader on February 15, 2017. Photo: Malcolm Wilton-Jones. 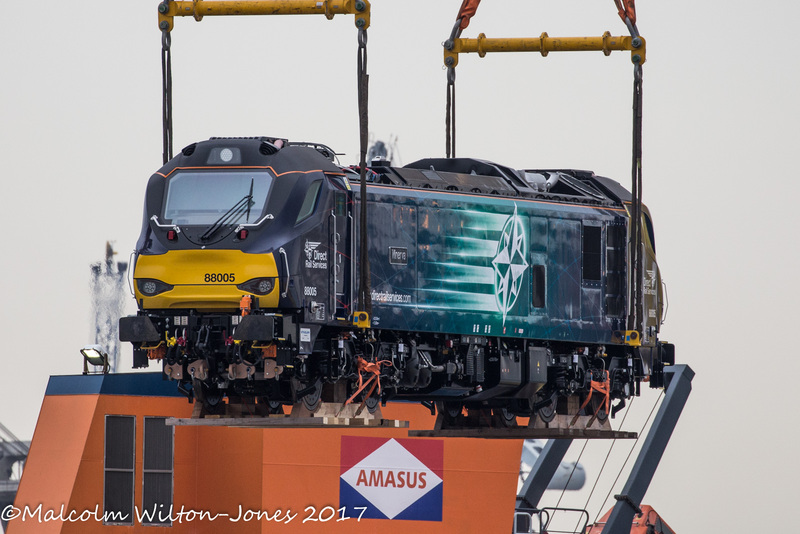 On February 23, loading of the five Class 88 locomotives onto the Eemslift Nelli took place and subsequently the ship left Sagunto for the UK. At the time of writing (February 28), the ship had entered the Irish Sea and the locomotives were only hours away from reaching their final destination: the Port of Workington. 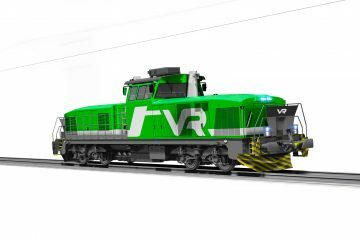 Delivery of the remaining locomotives is expected by mid-spring according to Direct Rail Services. 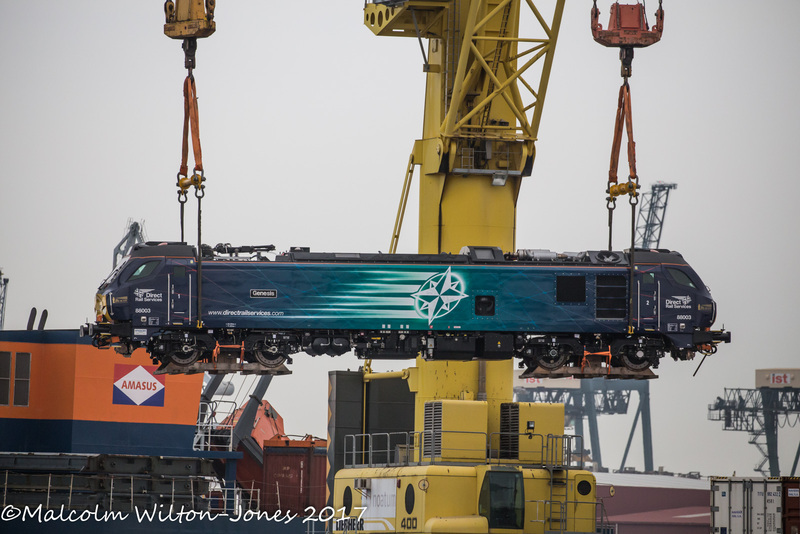 Beacon Rail / DRS 88003 ‘Genesis’ is loaded onto the Eemslift Nelli in the port of Sagunto, Spain, on February 23, 2017. Photo: Malcolm Wilton-Jones. 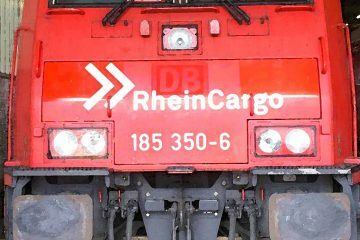 Beacon Rail / DRS 88005 ‘Minerva’ is loaded onto the Eemslift Nelli in the port of Sagunto, Spain, on February 23, 2017. Photo: Malcolm Wilton-Jones. 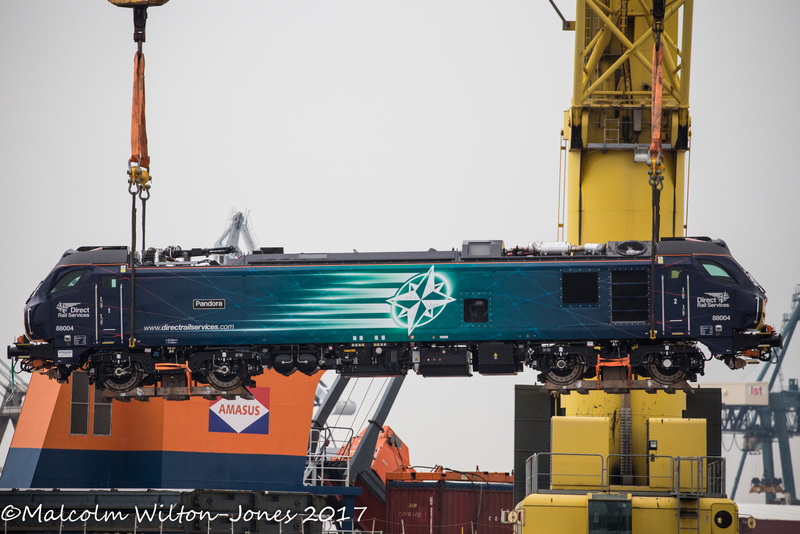 Beacon Rail / DRS 88004 ‘Pandora’ is loaded onto the Eemslift Nelli in the port of Sagunto, Spain, on February 23, 2017. 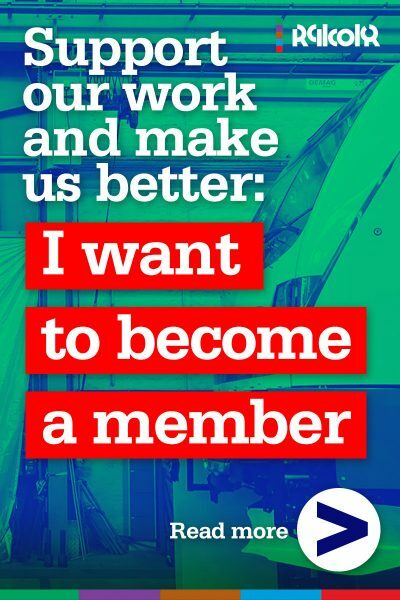 Photo: Malcolm Wilton-Jones. 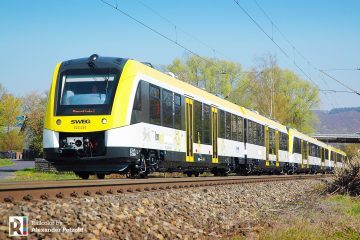 Learn more about Stadler UK Dual electro-diesels on MainlineDiesels.net.